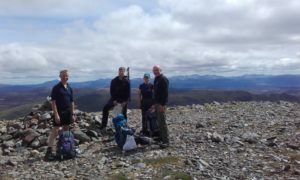 A small but select group of Bremex members spent the late May bank holiday weekend backpacking, wild camping, mountain biking and hill walking in a remote area of the central highlands to the west of Dalwhinnie. They camped for two nights by Culra Bothy, which is a good base for the ascent of a number of Munros that are too remote for normal human beings to climb in one day from the nearest public road. The trip started on the Saturday with the trek in from Dalwhinnie. Steve and Kevin, taking advantage of the relatively flat track along most of the ten-mile route, came in on their mountain bikes, while the other three used Shanks’s Pony. 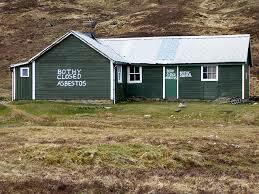 The bothy has been closed since March 2014 due to the discovery of asbestos and sadly its future remains uncertain. Despite this, the porch provided a handy cooking shelter, for which the group was grateful on that first day, as drizzle set in during the late afternoon and continued throughout the daylight hours, which in the Highlands last long into the evening at this time of year. The weather on the Sunday was dry. 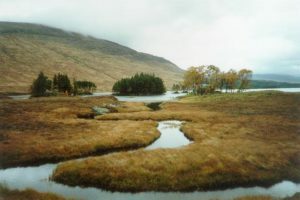 Although Ben Alder (1148m) and Beinn Bheoil (1019m), the group’s objectives for the day, were initially covered in cloud, this gradually lifted as they progressed along the ridge in an anti-clockwise direction, so that on reaching the second summit, Beinn Bheoil, they were rewarded with 3600 views. To ascend Ben Alder Steve, Kevin and Damian scrambled up Short Leachas ridge, while the other two opted for the walking route along Long Leachas ridge. The two groups then reconvened at the summit cairn. After Beinn Bheoil the ultra-keen Steve set off in his running shoes to descend almost as far as the bothy before climbing up again to bag an additional Munro, Carn Dearg (1034m). It was a great day out for everyone. Late May is the beginning of the midge season in the Highlands. A breeze kept them at bay on the Sunday evening, but Jude had picked up two ticks (small blood-sucking arachnids that lurk in long vegetation, such as bracken). Her tally had increased to four by the end of the trip, but for some reason they did not seem to be attracted to the men. Monday was the day of departure from Culra. The weather stayed dry, but although the cloud, which was very low in the morning, gradually lifted, it never cleared the summits. Jude and Clive, having packed their tents and other gear, set off early to walk the 21km through the narrow pass of Bealach Dubh (725m) and along the shores of Loch Ossian in order to catch an afternoon train from Corrour halt, on the edge of Rannoch Moor, to Tulloch, the next station on the line to Fort William. The rest of the group bagged three more Munros to the west of the bothy, the highest of which was Aonach Beag (1116m). Steve and Kevin left their tents at Culra, then returned to pack up camp and cycle back out to Dalwhinnie. Damian, however, carried all his gear up the hills in order to descend directly to Loch Ossian and catch an early evening train from Corrour. The bunkhouse at Tulloch is conveniently located in the former station building. Clive and Jude stayed there for three nights, enjoying the luxury of hot showers and meals prepared by the wardens. 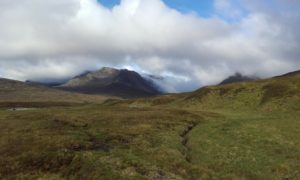 They climbed another four Munros on the Tuesday and Wednesday, experiencing mixed weather, with one really wet and windy day, when they got soaked to the skin, but glorious sunshine on their final day – a reminder that when the weather is good there is no better place to be than the Scottish Highlands.